You need a computer with a Google Chrome. A white box appears on top of a grayed-out page. Click "Encrypt Online". In the top center, click "Install Google Chrome plugin". At the top right, click the blue Free button. In the 'Add "Encipher It"' box, click Add. 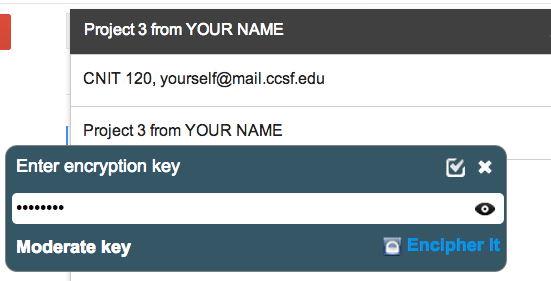 Open any web-based email, such as your CCSF Student Email. Note: If you are working in S214, you should use a different email account with a password you never use elsewhere. 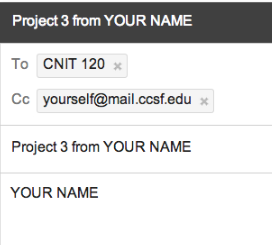 Compose a message as shown below, to cnit.120@gmail.com with a subject of "Project 3 from YOUR NAME", and YOUR NAME in the body. Don't use the literal text "YOUR NAME"--use your own name. Send a Cc: to yourself. On the upper right of the Chrome window, click the "Encipher It" icon, which looks like a padlock. 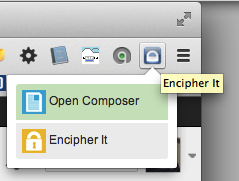 Two choices appear, as shown below: "Open Composer" and "Encipher It". Click "Encipher It". A box pops up asking for an Encryption Key. Enter CNIT 120 (don't forget the space after CNIT) and click the "Encipher It" button. The box asks, "Convert encrypted text into short link? ", click No. Open your Inbox and open the message you just sent yourself. 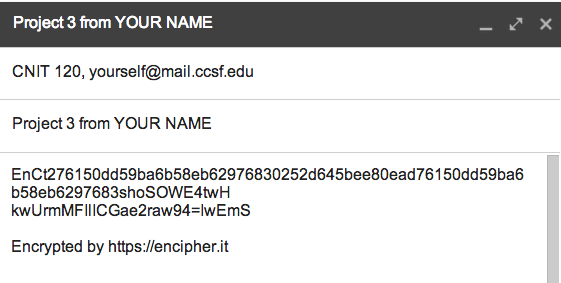 Click the "Encipher It" button, enter the key, and verify that your encrypted message becomes readable.